As competition for the time and attention of KOLs & hard-to-reach physicians’ increases, the need for Medical Science Liaisons (MSL) simultaneously increases. Organizations heavily rely on MSLs in their Medical Affairs functions to build and strengthen relationships with key healthcare groups. While organizations are becoming aware of the value that MSLs can bring, understanding other factors that influence the success of these teams is paramount. One area that plays a key role is budget allocation. In a Best Practices, LLC research report, we found that most companies’ MSL functions are funded by their Medical Affairs departments. From this, we investigated benchmarked respondent’s allocation of their MSL budgets. 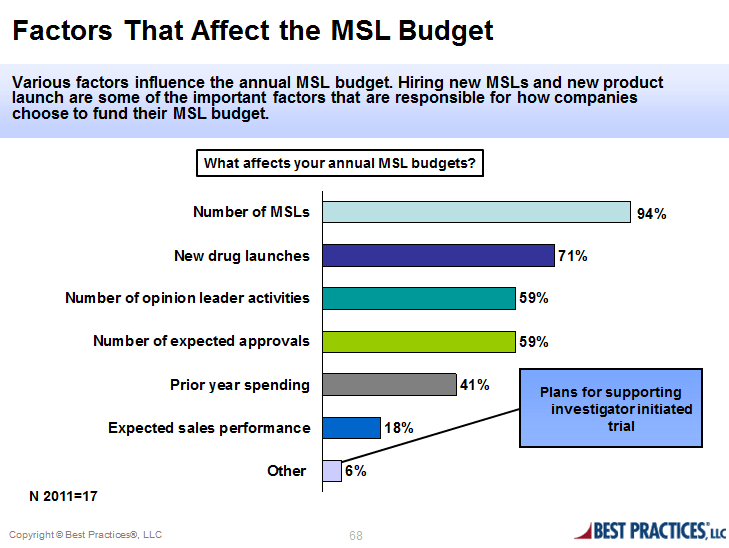 Depicted in the graphic below are the factors that affect how companies choose to fund their MSL budgets. Clearly, MSLs play a critical role in an organization. Along with the many roles that medical science liaison’s play, they also have an increased scientific knowledge that allows them to easily connect with clinical KOLs. Executives can better understand the need for, and the ideal usage of MSLs by better understanding standard industry resource allocations. MSLs can provide critical windows of insight into the market and competition, and by examining lessons learned leaders can increase their overall value.